Investors are reacting badly to the arrest of Saudi billionaire Prince Alwaleed bin Talal, one of the world's wealthiest men. Shares of Kingdom Holding, Prince Alwaleed's investment vehicle, sank for a second day after the chairman was targeted in an anti-corruption sweep. The billionaire was one of 11 princes arrested by a new anti-corruption body headed by the Saudi Crown Prince. 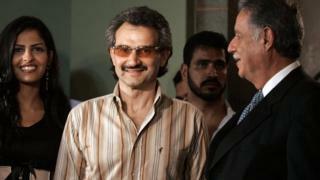 Prince Alwaleed holds shares in Citigroup, Twitter and Apple. "From a sentiment perspective, this will hurt the businesses associated with the prince," said Nabil Rantisi, the managing director of brokerage at Menacorp, a United Arab Emirates investment firm. "Major investors may shy away from these companies for a while until they have more clarity on the outcome of the situation". Analysts are speculating that 32-year-old Mohammed bin Salman, heir apparent to the Saudi throne, is consolidating power and asserting his control over the oil-rich kingdom. The sizes of Prince Alwaleed's holdings in Twitter and Apple have not been disclosed by Kingdom Holding as he has been secretive about his international investments over the years. Among the prince's other global holdings is Citigroup, in which he has owned shares since 1991, mass media corporation Twenty-First Century Fox and ride-sharing firm Lyft. The prince also owns the majority of Rotana Group, the Arab world's largest entertainment company, and London's Savoy hotel. Over the weekend, security forces arrested dozens of former top officials and ministers within hours after King Salman bin Abdulaziz Al Saud's decision to crack down on corruption. Prince Alwaleed's whereabouts are currently unknown. Some of the detainees are being held at five-star hotels across Riyadh, the Associated Press reported, citing a Saudi official. Saudi Arabia's finance ministry has said "firm decisions" by the anti-corruption committee will "help to reinforce the investment environment in the kingdom". Shares in Al Tayyar Travel Group, a Riyadh-based travel company, also tumbled after non-executive board member Nasser bin Aqeel al-Tayyar was arrested in the sweep. Investors are "extremely concerned by the weekend's events and we'll see further falls on Kingdom Holding in particular as it's very hard to define what the company is without Prince Alwaleed," said Marcus Chenevix, a Middle East analyst at TS Lombard. "The government is evidently struggling to find political equilibrium. This was a drastic move and it's hard to see that there won't be aftershocks following the earthquake." Kingdom Holding has not responded to emails seeking comment on Prince Alwaleed's detention. The stock has lost more than 11% in the past two days, and is currently trading at its lowest level since 2011. "No one knows how long this is all going to take and no one knows if the prince is going to come out of it the way he entered," Menacorp's Mr Rantisi said. Any investor reaction to the arrests may be premature, however, as "in the medium to long run, if the Saudis are able to link corruption to whoever was detained and if they sort the mess out, the move will ultimately create more transparency and could attract more foreign investment to the kingdom than ever before", he added. The price of oil reached a two-year high after the crackdown. Saudi Arabia is the world's biggest exporter of crude oil and the second-largest producer of the commodity. Brent crude oil hit $62.90 a barrel on Monday, the highest level for 28 months. Earlier this month, Forbes said Prince Alwaleed had an estimated net worth of about $17bn (£13bn), making him the 45th richest man in the world.